Follow us - and keep on top of the trends, hot topics and issues that shape the door, gate and hardware sectors. 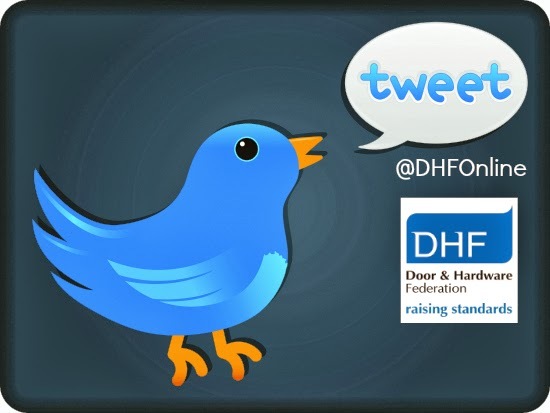 That is the message from the Door & Hardware Federation (DHF) which has launched its own Twitter social media service. Aimed at customers, specifiers, and contractors the DHF Twitter feed intends to deliver instant news on changes in legislation that impact on the choice of DHF member products and services. It will give the latest guidance on health & safety matters, technical standards, and maintenance issues. It will also promote DHF’s commitment to achieving best practice within the industry with its training programmes and adherence to quality assured standards. The Twitter conversation can be found on the website, www.dhfonline.org.uk and visitors are invited to join Twitter @DHFOnline and follow the DHF. “As the largest trade federation representing key players within the building hardware and industrial, garage door, doorset and powered gates industry sectors, the DHF has decided to ‘join the conversation’. It’s increasingly recognised that involvement in social media sites delivers real commercial advantage to businesses and is a powerful way to quickly spread news to industry contacts and customers. “Twitter is by far the quickest way to discover what’s new in the world, and this is exactly why the DHF has taken this strategic decision as part of our commitment to looking after the interests of our members and their customers. Twitter is the fastest growing online social networking and microblogging service that enables its users to send and read text-based messages of up to 140 characters, known as "tweets". DHF also has an active presence on LinkedIn, the business-orientated social networking site which allows LinkedIn members to establish networks of people and organisations they know and trust professionally. Members are also invited to join the DHF on Google+ which is an excellent social media platform for promoting the latest news in search engines quickly.